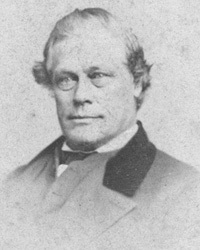 The nascent Republican movement included a number of disparate strains including anti-Nebraska Democrats, old-line Whigs, German- Americans, and abolitionists like Lovejoy. He was a delegate to the February 1856 Republican organizing convention in Pittsburgh, but he played little role in the Bloomington Convention beyond speaking in relatively moderate tones just before Mr. Lincoln. Known as an emotional and powerful speaker, Lovejoy spoke at Bloomington Convention just before Mr. Lincoln. Lovejoy’s relatively moderate speech displeased his friends and comforted some of his enemies – who included David Davis and Jesse DuBois. I have just returned from court in one of the counties of your District, where I had an inside view that few will have who correspond with you; and I feel it rather a duty to say a word to you about it. Your danger has been that democracy would wheedle some republican to run against you without a nomination, relying mainly on democratic votes. I have seen the strong man who could make the most trouble in that way, and find that they view the thing in the proper light, and will not consent to be used. But they have been urgently tempted by the enemy; and I think it is still the point for you to guard most vigilantly. I think it is not expected that you can be beaten for a nomination; but do not let what I say, as to that, lull you. Commenting on Lincoln’s House Divided speech at the 1858 Republican State Convention, Lovejoy said it would “shatter the doubtings of thousands of weak and timorous souls who are under the ban of pro-slavery sympathizing and small despots all about us. They can now defy these in the strength of Lincoln’s leadership.”25 In his renomination speech on June 30, Lovejoy played the role of unifier, saying: “The sooner we forget what we have been, and only remember that we are Republicans now, the better.”26 Mr. Lincoln subsequently campaigned frequently with Lovejoy and Lovejoy was overwhelmingly elected. In Congress, Lovejoy was an advocate of free labor, free trade, free land, and hard money. As he said in one debate: “…when you undertake to build up national prosperity, by means of a paper currency which does not represent dollar for dollar, and is not convertible into specie, it will not stand. But, Sir, when you build it upon hard money, upon a metallic currency you have built your house upon a rock, and it will stand the test of all the storms that may beat upon it.”29 He was a persistent thorn in the side of the Buchanan Administration on corruption matters and military appropriations. 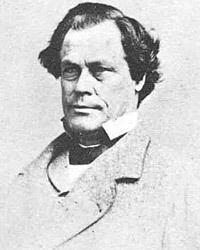 Lovejoy became chairman of the Committee on Public Lands. Together with Galusha Grow, chairman of the Committee on Territories, he shepherded Homestead legislation through Congress only to have Buchanan veto it. 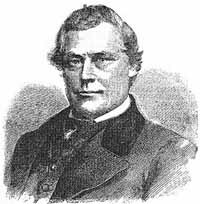 On April 5 1859, Lovejoy gave a fervent speech against slavery that caused a near riot on the floor of the House when Lovejoy strayed onto the Democratic side of the House and insisted on the rights of slaves to fight for their freedom. Rufus Rockwell Wilson, editor, Intimate Memories of Lincoln, p. 562 (Cordelia Perrine Harvey, from a lecture manuscript). Isaac N. Arnold, The Life of Abraham Lincoln, p. 251. Edward Magdol, Owen Lovejoy, Abolitionist in Congress, p. 273. Isaac N. Arnold, The Life of Abraham Lincoln, p. 229. Edward Magdol, Owen Lovejoy, Abolitionist in Congress, p. 277. P. J. Staudenraus, editor, Mr. Lincoln’s Washington: The Civil War Dispatches of Noah Brooks, p. 111-112 (February 15, 1863). Edward Magdol, Owen Lovejoy, Abolitionist in Congress, p. 186. P. J. Staudenraus, editor, Mr. Lincoln’s Washington: The Civil War Dispatches of Noah Brooks, p. 308 (March 9, 1864). Carl Sandburg, Abraham Lincoln: The War Years, Volume II, p. 477. Francis B. Carpenter, The Inner Life of Abraham Lincoln: Six Months at the White House, p. 47. Carl Sandburg, Abraham Lincoln: The War Years, Volume II, p. 600 (Letter from Owen Lovejoy to William Lloyd Garrison, February 22, 1864). Francis B. Carpenter, The Inner Life of Abraham Lincoln: Six Months at the White House, p. 18. Justin G. Turner and Linda Levitt Turner, editor, Mary Todd Lincoln: Her Life and Letters, p. 174 (Letter from Mary Todd Lincoln to Charles Sumner, April 5, 1864). Roy P. Basler, editor, The Collected Works of Abraham Lincoln, Volume VII, p. 366. Nathan William MacChesney, editor, Shelby M. Cullom, Abraham Lincoln: The Tribute of a Century, 1808-1909, “Lincoln and His Relations with Congress”, p. 504. Francis B. Carpenter, The Inner Life of Abraham Lincoln: Six Months at the White House, p. 17. David Donald, Lincoln Reconsidered, p. 114. P. J. Staudenraus, editor, Mr. Lincoln’s Washington: The Civil War Dispatches of Noah Brooks, p. 112 (February 15, 1863). Roy P. Basler, editor, The Collected Works of Abraham Lincoln, Second Supplement, p. 9-11 (Letter to Jesse Olds Norton, February 16, 1855). Roy P. Basler, editor, The Collected Works of Abraham Lincoln, First Supplement, p. 27 (Letter to David Davis, July 7, 1856). Willard L. King, Lincoln’s Manager, David Davis, p. 197. Roy P. Basler, editor, The Collected Works of Abraham Lincoln, Volume II, p. 435-436 (Letter to Owen Lovejoy, March 8, 1858). Roy P. Basler, editor, The Collected Works of Abraham Lincoln, Volume II, p. 458-459. Willard L. King, Lincoln’s Manager, David Davis, p. 118. Edward Magdol, Owen Lovejoy, Abolitionist in Congress, p. 201. Edward Magdol, Owen Lovejoy, Abolitionist in Congress, p. 203. Don E. Fehrenbacher, Prelude to Greatness: Lincoln in the 1850’s, p. 102. Edward Magdol, Owen Lovejoy, Abolitionist in Congress, p. 219. Edward Magdol, Owen Lovejoy, Abolitionist in Congress, p. 174. Edward Magdol, Owen Lovejoy, Abolitionist in Congress, p. 249. Edward Magdol, Owen Lovejoy, Abolitionist in Congress, p. 302. Edgar DeWitt Jones, Lincoln and the Preachers, p. 66. Edgar DeWitt Jones, Lincoln and the Preachers, p. 69. Walter B. Stevens, (edited by Michael Burlingame), A Reporter’s Lincoln, p. 76. William F. Moore and Jane Ann Moore, Collaborators for Emancipation: Abraham Lincoln and Owen Lovejoy, p. 156.